German-born composer Jessica de Rooij has emerged as a composer well capable of handling heavy action and fantasy subjects, while maintaining a strong sense of melody and harmonic orchestration. Her score for BLOODRAYNE II, which transported the titular vampire huntress to the American Wild West, is a vivid melodic composition that’s as much the gunslinger’s Western Americana as it is the vampire’s European Gothic. The first BLOODRAYNE was scored by fellow countryman and Hans Zimmer alumni Henning Lohner (de Rooij’s collaborator on IN THE NAME OF THE KING); in the sequel de Rooij livens things up with a score that is vivid and rhythmic, and has been rightly called a retro-Western score, rich in anachronistic 1960s instrumentation and cadences, sustained eerie atmospheres, and a terrifically cool Italian Western styled theme for BLOODRAYNE that greatly enlivens the film. FAR CRY, albeit less eloquently fantastic and more of a straightforward thriller (well, at least until the monsters come out), is a good contemporary action score (appropriate enough since, like most of Boll’s films, it is based on a first-person shooter video game). De Rooij’s score is nicely textured and nuanced, and, gamelike, dominated by mostly aggressive hybrid action material, driving strokes of violins and keyboards and potent, declarative dissonances for brass and percussion (soundtracks from both films are available from MovieScore Media). 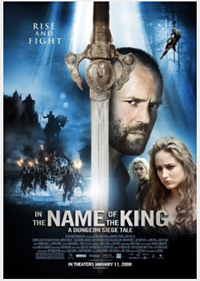 Uwe Boll’s very own Shirley Walker, de Rooij continues to provide powerful and aggressive action scores. De Rooij began her music studies in Holland, and then began to compose at the age of 24 in her parents’ home in Cologne, Germany. She completed her Masters Degree in 2005. Having worked almost exclusively with controversial, independent filmmaker Uwe Boll, de Rooij when she came to Hollywood was the youngest female composer working in the Hollywood film music business. I recently interviewed Jessica about her experiences and views in the world of film music and working in Uwe Boll’s cinema. Q: You’ve had a diverse musical background. What led you into composing for films and how did you get started doing that? Jessica de Rooij: As a young girl, I already pointed out the music in movies to my parents. My piano compositions always sounded like film music. Many people told me this in my teenage years. At some point I had to study film music because my passion for it was growing more and more, even after I already had record deals with big companies and earned my first money as a performer. But my parents kept on supporting me to develop myself towards the direction I really wanted to go. Q: You’ve worked almost exclusively for director Uwe Boll, so far. How much input does he have in the music for his films? Jessica de Rooij: Most of the time I receive a rough edit of the movie and after viewing we discuss our ideas how to approach the music. We have a very good relationship. He completely trusts me and leaves me all creative freedom. I know what he likes and dislikes. If he wants anything to be different, it is mostly just a little thing like adding an instrument. But we never disagree on anything what makes my work much easier. Q: How would you describe your approach to scoring IN THE NAME OF THE KING, and how did you collaborate with Henning Lohner on creating the musical score? Jessica de Rooij: We split up the movie into scenes each of us had to write. I was composing the “Stonebridge Scenes” in Cologne and he was composing the “Bad Guy Scenes” in Berlin. We send each other ideas by email and both kept in touch with the director. I did the first two battles and he worked on the last battle. The recording sessions were in Berlin – we had to record around 160 minutes of music. It was a lot. Q: How did your score for Boll’s SEED develop to support the film’s intensity and give it the supporting musical impact you felt it needed? Jessica de Rooij: Next to the usual scary scenes with some prepared piano, eerie ambience, and string effects, I had to support the violence, for example, by using orchestral elements and build up to a climax. But sometimes I used more electronic sounds (especially for the electric chair fragments). And in other scenes which were more family related, the music asked for something very dramatic and sad because throughout the movie we slowly got more and more attached to the police officer and his family. That was introduced early with the piano theme, and later with dramatic strings, especially in the final scene. Q: The majority of the films you have scored have been fantasy and horror topics. What led to your affinity in writing music for films in these genres? Jessica de Rooij: Funny enough recently we’ve worked on total different topics, some also based on true stories. But to return to your question: Fantasy was not a problem for me because I love to escape into a fantasy world myself, even if it is just behind the piano. 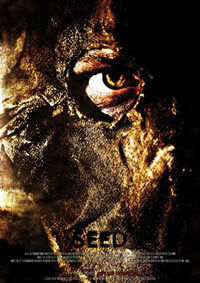 But I had no idea how to approach a horror movie until I had to work on SEED. I never watched these kinds of movies as a young girl, so it was new to me. My music was more childish, peaceful, sad, melodic, and dramatic and didn’t fit into the world of horror movies. But I always loved to write dissonant music as well. I already experienced on the piano at the age of five and created my own dissonant and modern music pieces. By working on those movies I probably discovered my dark musical side more and more as well. Q: Who would you say has influenced you as a film composer – and how have you emulated those influences and yet developed your own voice as a composer? Jessica de Rooij: I believe my parents influenced me the most. My father was a composer himself and he wrote down lots of piano improvisations for me to study. I also hear his harmonies and melodies sometimes returning in my music, very interesting how this works. Growing up in a musical home and listening to a lot of classical and jazz music must have influenced me probably the most. Q: All of Boll’s films have been very different in tone and scope. How did you decide on the approach to scoring POSTAL and support its manic style with music? Jessica de Rooij: Yes, they are vastly different from one another. 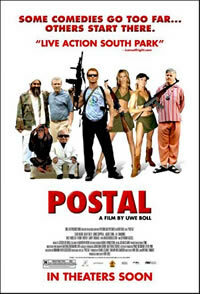 POSTAL was something totally new. One thing was for sure, the movie was totally over the top and the music had to do the same thing. I needed to compose in many different styles and still create one full picture of it. I also recorded some of the songs in the movie. That was a lot of fun. Q: Boll also tends to write and film his movies pretty fast. What kind of schedule and budget have you had on his films? Are you allowed orchestras or are these mostly synth and sample scores? Jessica de Rooij: Schedules are always very tight because Uwe Boll makes so many movies and has wanted me to score all of them, so far. Over the years things just go by themselves and we don’t lose much time by getting to know new people, explaining things, etc. We are used to working with each other and we know what is expected and what is possible. We build up a very trusting environment with a lot of creative freedom what I really appreciate. Often times he leaves it up to me if I want to record or not, especially when the budgets are not so big. I tend to always record real musicians because it makes the music so much better. For the last movie, DARFUR, I recorded all the musicians I wanted to and paid it out of my own pocket because I really felt the movie needed it. Uwe totally left that up to me because he trusts that I will deliver good quality for him, recorded or not. For bigger movies I mostly get a certain budget to work with and then I can fill it in the way I would like to do it. 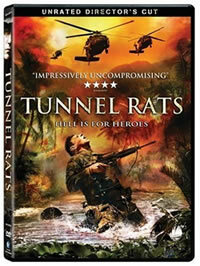 Q: TUNNEL RATS was a violent war film set in the Viet Nam era. How did you support its setting, story, and sense of action with your score? Jessica de Rooij: With TUNNEL RATS the message is that war doesn’t make any sense and we all die together at the end anyways. So we didn’t need much action music, we mainly used dramatic string lines to support the right feeling for these movies. I also worked with singer Caitlin Tortorici, whose voice, in my opinion, touches people much more because they can identify themselves with it. We used the same approach for the war movie DARFUR, which I have just recently finished scoring. Here I worked again with a singer and incredible musician: Arto Tuncboyaciyan. I think we created something very special for this movie and I hope we will touch many people with this music. 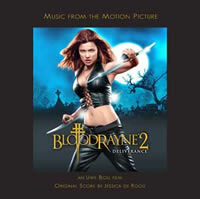 Q: BLOODRAYNE II was a compelling score with a fine melodic, orchestral base. How did you develop the score and how did your experiences composing additional music on the first film impact what you were composing for the first sequel? Jessica de Rooij: For the first film I just had to fill up some minutes, which were not scored yet. For this I used the composer’s material and worked with that. For BLOODRAYNE 2 I faced a different type of movie: a western. I created new themes. There was not much time to write the score so I had to be very creative on how to get all the music to be written on time. The budget limitation also challenged me to be more creative. I recorded my brother Jacques who plays all kinds of instruments, we experimented with everything from coke bottles, percussions, guitars, and pans in my studio and some really nice ideas started to develop. He also has a great voice so I had him sing some parts in the opening titles. I think this movie was so far the most intense project I have worked on but it was a great learning experience and everybody was very happy with the result. Q: Another sequel you scored was ALONE IN THE DARK II. What elements of the film, when you first spotted it, suggested to you the kind of music the film needed? Jessica de Rooij: I thought about the instrumentation because the movie is a combination of fantasy and horror… I decided to combine some orchestral colors (harp, piano) with electronic patterns and effects. To keep the tension, we also need something hunting or chasing… that’s how I decided on the rhythmical patterns. Then I wrote a few motifs and elements for the invisible witch and used variations throughout the movie every time she returns. Q: What provoked your musical approach for STOIC, another fairly intense and almost brutal film. What kind of music did you feel it needed, and how did you craft that into a full score for this film? Jessica de Rooij: Uwe and I both agreed the movie didn’t need a lot of music. Silence worked so well for many scenes and made the harshness much more intense. But the intensity of silence only works well if you have a little bit of music sometimes of course, otherwise there is no silence! For this, I chose scenes where we can make the audience feel that it is so wrong what is happening in this prison cell… The movie shows the audience what people are capable of doing and the music here has to achieve that feeling. The story is based upon a real happening in Germany. Hopefully it will wake up some people. Q: You started out in the Netherlands and then (recently?) moved to Los Angeles. How would you contrast composing and recording music in Holland versus that in Hollywood? Jessica de Rooij: I studied in Holland and right after my Masters in 2005 I traveled to Los Angeles back and forth to get to know the real world. But the first few scores (IN THE NAME OF THE KING, SEED, POSTAL, BLOODRAYNE 2) I composed in my parents’ house in Cologne when I was 24. All my family became involved as you can see in the music credits. Our house suddenly became a film music factory; orchestration and music preparation all happened there. I composed four to five movies in just one year and without the support of my family I would never been able to do that so early in my career. Here in Los Angeles, people get hired for every little thing and there is barely one person that does all these jobs by themselves. I still tend to do this because I like to be in control of my music but the more movies I do, the more people I need to support me with the organization of things. Back in Europe I didn’t have that; it was just me and my family. Q: What are your plans for the future (I see you have another fistful of Uwe Boll films set to score, including BLOODRAYNE 3!) – Where would you like your career in film music to take you over the next five or ten years? Jessica de Rooij: I think it’s not only a question for the next five or ten years. My goal is to continue to develop my creative quality and work on my own musical voice. I have a feeling I will still do this when I am 80 years old because there is so much out there which I’d like to study. Danny Elfman’s on-off-on treatment by the producers of THE WOLFMAN [sic] notwithstanding, his score for the problematic picture (the fact that there are 34 people credited in the film’s music department should suggest that somebody didn’t have a clear picture of what they wanted, and when they finally did, they wanted it in a week or something, requiring an assembly line staff and additional music provided by Conrad Pope, Ed Shearmur, and T J Lindgren) as it exists on CD, released by Varese Sarabande, is quite an eloquent and moody mystery thriller score. I haven’t had a chance to get out to see the film yet, so I can’t speak to its usage there, but the score sounds great on the album. Appropriately, Danny chose strings as the score’s main instrumental base, in homage to the classic Universal monster movie sound, and it provides an eloquent and sympathetic center to his horror score. With the exception of Dracula, all of Universal’s classic monsters are in truth sympathetic and misunderstood characters (and even Dracula had a sympathetic back-story outside of the Universal films), but none more so than Larry Talbot, the man cursed to “become a wolf when the wolf bane blooms and the autumn moon is bright.” Elfman treats the new Larry Talbot with equal empathy but cuts no corners in giving him the full monster treatment when fur bristles and fangs gleam. Opening with a pair of “Wolf Suites,” Elfman puts his theme through a rhythmic and very Danny Elfmanlike treatment, his intricately flavored violin theme loping along on a percussive roller of percussion and piping brass and winds. Parts of the violin treatment have almost a John Williams/DRACULA flavor, a similar sensibility of horrific romance about them, although of course circulated around a very Elfman-esque propulsive cadence, and provides a compelling progressive riff for the stalking lycanthrope. This is in contrast with his much more sensitive portrait of Larry Talbot, the cursed man, exemplified by the melancholy string interaction in “Wake Up, Lawrence.” His music for the transformation scenes embody both aspects of his violin material, eventually waking up the brutish brass and drums as the wolf man emerges and assumes his being, a strong, surging tide of relentless, shouting brass carrying on their cusps brief, sonorous semblances of the Talbot theme, reminding us of the humanity of the inhuman beast that now prowls the night. 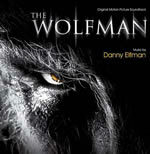 Elfman’s “Finale” reverses the pattern and allows the sensitive Larry Talbot motif to emerge one final time; while a shorter version of the “Wolf Suite” darts amid the shadows of the end titles. 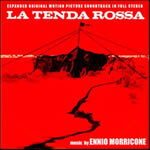 Legend Records of Italy has released an expanded version of Ennio Morricone’s masterful epic score to THE RED TENT, a 1970 Italian-Russian co-production stylishly telling of the 1928 Arctic airship Italia and its ill-fated expedition to the north pole, and subsequent rescue missions that resulted in the death of famed Arctic explorer Roald Amundsen. Morricone’s score, superlatively expressed through the voice of Edda Dell’Orso, is one of the composer’s finest, and inexplicably has been rather elusive on soundtrack LP and CD. This new release combined the complete contents of the 1971 Paramount Records LP, including the 22-minute sound collage that filled out side 2, “Others, who will follow us,” with the score’s more dissonant and experimental music (the Russian version of the film contained a different score, by Soviet composer Aleksandr Zatsepin (available from rarecds.com), with 6 additional tracks, mostly variations of the primary themes included on the Paramount LP, but the alternate renditions are all very interesting and welcome, with a more isolated, distant rendition of the main theme, a waltz variation, a 3-minute version of the essential vocal and atonal elements of “Others, who will follow us,” an alternate version of the love theme with orchestra and choir but without Dell’Orso’s vocal melisma, and the previously unreleased end title, which is a variation of the main theme. After their release of LE VOYAGE EN BALLON (reviewed in the August 28th column), Canada’s Disques Cinémusique has released a pair of notable Jean Prodromidès soundtracks. The first, reissuing the score to DANTON, director Andrzej Wajda’s 1983 adaptation of a Polish political drama play about a duel between two very different players during the French Revolution, which had some very interesting parallels with 1980 Poland. 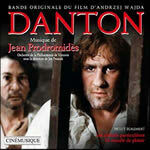 Prodromidès’ striking score comprises difficult and discordant music for large orchestra and choir. The music is a thoroughly atonal composition for flowing layers of orchestra and voice, piano string scrapes and other percussive effects, rising in harmonic colors and severe, aggressive tonalities well befitting the dueling personalities centered in the film. The music is awkward at first, but an attentive listener will glean the beauty of its harmonic nuances and find the treasures in its lack of tonality. It’s harsh and grating resonances provide an intense psychological portrayal of the times, its passionate characters, and its political extremes. First issued on LP in France and the US in 1983, this is the score’s first release on CD; the film was the composer’s last score, and his only work subsequent to the 1976 score for THE EDUCATION IN LOVE OF VALENTIN. Included on the CD are two Prodromidès’ scores previously issues only on EP. One contains music for the 1964 drama, LES AMITIÉS PARTICULIÈRES (THIS SPECIAL FRIENDSHIP), about a platonic homosexual relationship between two boys in a religious college. The film is gently scored for boys’ choir and orchestra, reflecting both the setting and the relationship. The other is the 1960 Roger Vadim lesbian vampire movie, ET MOURIR DE PLAISIR (1960; BLOOD AND ROSES, second, since Dreyer’s 1932 VAMPYR, adaptation of Le Fanu’s Carmilla). Gothic tonalities and searing romantic sweep of Hammer’s 1970 version, THE VAMPIRE LOVERS, Prodromidès provided an enticing romantic score for strings and organ, and a persuasive melody for harp that spoke alluringly for the feminine complexities of the vampiric liaison. 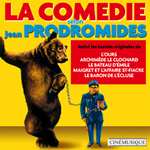 The second album is entitled Le Comédie Selon Jean Prodromidès and is a collection of the composer’s comedy works, compiling music from five films from 1959-1960. This includes the 16-minute hyperactive, carnivalistic score for L’OURS (1960; The Bear), which features six solo mandolins harmonizing amidst the orchestra. The score’s jaunty main theme is a comic waltz for clarinet and strings; other themes a parodies of Bach and other popular musical forms. The most striking score in this collection is surely that for Gilles Grangier’s madcap comedy, ARCHIMÈDE, LE CLOCHARD (1959), which featured an especially vibrant and intoxicating main title motif, driven by slappy percussive guitar strums and a festive main theme in triple time for clarinet and strings (I could listen to this track all night). Other themes, most of which are very different from one another, features an impassioned accordion (“Quais de la Seine”), a splendidly inebriated polka for tuba and orchestra (“Polka des homes-sandwiches”), and lively Charleston for banjos, honky tonk piano, and brass band. A single short suite supplies music for 1962’s LE BATEAU d’EMILE (Emily’s Boat), a pretty valse for accordion and brass, while Prodromidès contribution to the long running Maigret detective series, SAINT-FIACRE (1959; Maigret and the St. Fiacre Case) is represented by three tracks: a nicely-textured and tuneful score featuring alto saxophone, concluding with a marvelous get-out-of-your-chair cha-cha. The final film is LE BARON DE L'ÉCLUSE (1960; The Baron of the Locks), represented by six tracks, beginning with a lush, Viennese waltz, a sorrowful accordion melody for the female heroine, a roguish, almost cartoonlike melody for oboe, paired flutes, triangle, and strings; while a trio of dance flavored source cues, featuring marimba and accordion close out the CD. Both albums contain booklets with informative notes about the films and their scores, in French and English by Christian Texier. Prodromidès is so under-represented by soundtrack albums, especially on CD; many thanks to Disques Cinémusique’s efforts in getting a start on remedying this. John Williams’ long-awaited full score for the 1977 terrorist thriller, BLACK SUNDAY, finally achieved a legitimate release from FSM last month. Hitherto available only via tracks on a few compilations and a couple of boot CDs, FSM’s quality production offers the full score, 24 tracks and 55:11, plus a fistful of alternate and source tracks. The music is in Williams’ best mid ‘70s action vibe, surging, rhythmic brasses that energize and give a sense of potent unease to this story of terrorists flying a bomb-laden blimp into a packed sports stadium during the Super Bowl. Williams builds up a pulsating action riff – solo timpani here, reverbed xylophone there, brutal piano arpeggios, pensive woodwinds, repeated piano notes, pizzicato strings, etc., from the throbbing pulse of “Commando Raid” and “Airborne/Bomb Passes Stadium” to the charging ahead rhythms of “Miami/Dahlia’s Call” and “Preparations” and the more subdued, sinewy, and tense moments of “The Test” – that gives the score a punchy drive and a heart pounding suspense. The score’s focus is on this sense of rhythmic propulsion, eschewing love themes and other melodic trivialities, just as the single-minded focus of the movie and its zealous terrorists is on their mission. Williams understood that and crafted a score that was equally as psychological sound and driving. This is a much more contemporary score than the STAR WARS and INDIANA JONES scores that would occupy most of Williams time beginning later this same year. 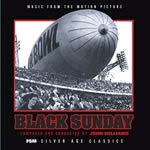 With BLACK SUNDAY, which falls between 1976’s MIDWAY and 1977’s STAR WARS, Williams was able to cover some musical ground he wouldn’t really experience again until the following year’s THE FURY and thereafter only sporadically as assignments kept him more fluently in the Stravinsky-esque camp. As the writers of the album notes (Scott Bettencourt, Mike Matessino, Jeff Eldridge, and Alexander Kaplan; thoroughly informative at 24 pages) describe it, imagine a world where a new Williams score came out without any knowledge of STAR WARS. It puts this score in an entirely different place, since from our 2010 perspective it is impossible to reflect on BLACK SUNDAY without some reference point taken from its immediate and far more earth-shaking successor than the blimp bomb movie. The album provides two dozen tracks of full score, plus a trio of source cues (hotel lobby muzak, a pair of fight songs for the Super Bowl) and two alternate mixes. 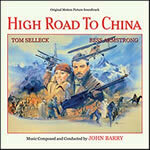 One of the new releases from my hosts here at BSX Records is a rerelease of John Barry’s score for HIGH ROAD TO CHINA, in which Tom Selleck (as in LASSITER, also released by BSX – scored by Ken Thorne) emulates the Indiana Jones role he lost out on in a somewhat similar pulp adventure story. Barry’s score is breathtaking, its main theme one of his finest and most attractive melodies, exuding romance as well as adventure. The score has been frequently released but just as frequently out of print; first issued on LP in 1983 by John Lasher’s Southern Cross and several labels in Europe; it didn’t hit CD until a 1990 release, limited to 2000 copies, from Southern Cross. In 2000, Supertracks reissued the Southern Cross CD, adding eleven source cues of minimal interest – Charlestons and other dance cues used in dance hall scenes and such; I mean, whoever wants to get this for the Barry music is not going to have much of an interest in handfuls of generic 20’s jazz tunes; even two cues of Barry-written source (Mohamet’s Dance and Waziri Source) are of minimal musical interest. BSX’s new release reissues that Supertracks album, source cues and all, but had added a 9:25 “Suite from High Road to China,” an edited version of the score’s main themes very nicely put together and making for a great listen on its own. This is a score that deserves to stay in print, and be issued, for years and years; it’s an essential Barry score; the source cues remain negligible, as far as I am concerned, but the suite, even if it’s compiled from previous tracks on the album, makes for a compelling and very satisfying listen on its own. 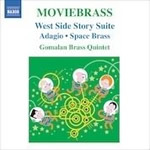 Naxos has released a new album by the Gomalan Brass Quintet, who in 2004 released a very interesting self-titled album that included, among other movie themes, an amazing 9:16 minute suite of themes by Ennio Morricone, wonderfully transcribed for horns. Ranging from THE MISSION, into the thunderous main theme from THE GOOD, THE BAD, AND THE UGLY, and progressing through the harmonica theme ONCE UPON A TIME IN THE WEST, dolefully intoned by low trumpet, the quintet opens into the raucous Cheyenne theme from the same score (oddly introduced by a chortling little clown saying something in Italian), which merges into Jill’s Theme, which brings us back into an especially snarling version of the GBU motif. The interpretation of Morricone’s intricately conceived compositions are perfectly designed for the brass ensemble, which gives the themes an amazingly unique and fresh sound. The CD also included variations on Alan Silvestri’s FORREST GUMP theme and two pieces by John Williams (SCHINDLER’S LIST theme and ”Olympic Fanfare”) and, to close things off on just the proper manic note, a brass quintet arrangement of Hoyt Curtin’s theme from THE FLINTSTONES. The quintet has just released their next album, again on Naxos, titled MOVIEBRASS, and is a similar enthralling and very fun interpretation of movie themes delightfully rearranged for five brass instruments. The album includes essentially all of Leonard Bernstein’s WEST SIDE STORY, which technically is a musical play, only secondarily a movie score, but why quibble? It’s wonderful, the vocal solos and choruses beautifully rendered by trombone and trumpet and the like. We then run the gamut of sci-fi scores in a suite entitled “Space Brass” – themes from SUPERMAN, E.T., STAR TREK TV, INDEPENDENCE DAY, APOLLO 13, and CLOSE ENCOUNTERS, followed by a hearty interpretation of the INDIANA JONES theme. Some of these tend to run a little thin as they go on with so little instrumental variance, but they do remain interesting; and rendition of the CLOSE ENCOUNTERS alien conversation is marvelous. Concluding the album is a splendid version of Danny Elfman’s theme for THE SIMPSONS, with Elfman’s manic pizzicato strings and glissandos of harp delivered marvelously by the brass quintet. Album closes with a very interesting rendition of the theme from anime’s LUPIN III, combining two sources, one a waltz form arrangement made in Italy by Franco Micalizzi, the other by LUPIN III’s original anime composer, Yuji Ohno. It’s all brassy wonderment. 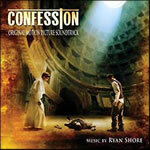 Director Jonathan Meyer’s 2005 thriller, CONFESSION, is a kind of modernized take on Hitchcock’s I CONFESS, in which a man confesses murder to a priest, who is bound silent by the pact of confession, but faces difficult choices when he himself becomes a suspect in the same murder. The film explores elements of commitment, tradition, sanctity, and various species of ethics, all of which are eloquently reflected in Ryan Shore’s graceful and introspective score, just now released on CD by La-La Land. In his notes on the album booklet, Shore notes that he strove to have the music speak to the gravity and severity of the events while also reflecting the intimacy of the religious boarding school setting and, especially, the serious importance with which the students hold their studies and experiences at the school. The latter nuances are emphasized in the main theme, which also suggests in its somber tonality and pensive mood the conflict that the main character undergoes in this process. A solo female melisma echoes the most introspective moments undertaken by the character of Luther, the confessor, supported by a haunting undertone of male choir, which suggests the male society in which the story takes place. Ethnic woodwinds provide an interesting texture to denote the historical and multicultural context of the religious studies, while a breezy theme reflects Luther’s sense of freedom away from the school and the shackles his crime and his confession weigh upon him there. Beyond the score’s structure, purposefully laid out and intentionally complex, is the very weight of the sound, the tone, even the melodies. Shore has created a thick curtain that hangs heavily over the story and over the characters – it becomes the tangible essence of guilt, of accountability, and of duty and honor. Intrinsically connected to the finer nuances of its story and its character’s psychologies, the score plays out very well, tonal and well textured, hauntingly atmospheric, and reflectively somber – a tone poem for the movie’s exploration of these elements. It’s a listening experience that houses as much dramatic weight on its own as it does with the coherency of the visual story. Beyond that, tracks like “Philosophy” and “Requiem” and “Sacred” have a heartbreaking beauty, and the baritone range of most of the score is extremely compelling and affecting. Among Digitmovies latest archival restoration of Italy’s vibrant film musical past is Angelo Francesco Lavagnino’s score to L’ASSEDIO DI SIRACUSA (SIEGE OF SYRACUSE), Pietro Francisci’s 1960 historical romantic drama taking place in the life of the inventor Archimedes during the Punic Wars of ancient Rome. Like most forgotten scores for these forgotten films, Lavagnino’s music is thoroughly entrancing and lovely, built around a splendid romantic melody for strings over choir – the choral orchestration is a little old fashioned by today’s standards, but it harbors an evocative sensibility that gives the story, about love won and love lost in war, an honest poignancy. The storyline has taken the true facts of Archimedes and grafted onto it a compelling personal romantic history that gives the ancient historical romance a bit of identifiable contemporary relevance – kind of a PEARL HARBOR for 1960s peplum, if you will. In contrast with the delirium of his romantic melodies, Lavagnino provides several climactic action cues for the battles in Syracuse harbor, and a powerful ballet for a shipboard scene; the emphasis, though is on the impassioned love themes, and these are very nicely endowed. 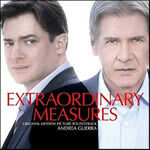 Italian composer Andrea Guerra’s score for EXTRAORDINARY MEASURES (replacing a rejected score turned in by Alex Wurman), has been released by Lakeshore. The film stars Brendan Fraser as John Crowley in a true story of a man who defied conventional wisdom and risked his family’s future to pursue a cure for his children’s life-threatening disease by teaming up with an unconventional scientist (Harrison Ford) to develop a life-saving drug. Guerra has been scoring films in Italy since 1990, with 85 scores to date. His music for EXTRAORDINARY MEASURES is just what you would expect for a film like this, with its frequent tugs on the heartstrings and ultimate sense of victory and validation; the score works very well and makes for a fine listen on CD. Guerra has a strong knack for breezy melody and honest poignancy, favoring strings and piano, and the occasional blossom of a happy pop motif, as in the celebratory midsection of “I Didn’t Do It For You.” But much of the album is fraught with trepidation as the work for a cure remains uncertain; Guerra convincingly echoes this in the music, which while positively flavored also maintains the realistic solemnity of potential failure. The soundtrack, therefore, is as much a journey as the story, with similar expressions of hope, doubt, and ultimate triumph. In addition to the 15 individual tracks, the album is filled out by a 7:19 suite comprised of the score’s primary element, which is a nice way to revisit the music. God bless all parents who never said “that’s a waste of time” and stifled creativity in the bud. And too bad Disney hasn’t seen fit to release the soundtrack to UP! on actual CD. Congrats also to sound editor Paul N.J. Ottosson, husband of virtuoso er-hu player Karen Han (THE HURT LOCKER, STAR TREK, THE FORBIDDEN KINGDOM, KUNG-FU PANDA, MEMOIRS OF A GEISHA, etc, see www.karenhan.com ) for his Oscar for best sound design for his work on THE HURT LOCKER. In other awards of note, Cinefantastiqueonline has announced its “Wonder Awards,” celebrating the annual best in science fiction, fantasy and horror cinema and TV. They also awarded Giacchino for best music, only for STAR TREK instead of UP! 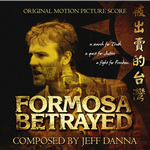 Jeff Danna’s new score, FORMOSA BETRAYED, is available via iTunes. The film is a murder thriller with political overtones, taking place in 1980s China. Also recently noticed on iTunes are otherwise unreleased scores from LAKEVIEW TERRACE (Jeff and Mychael Danna), LEGEND OF THE SEEKER (TV series, Joseph LoDuca), Film Score Collection Volume I from composer Siddhartha Barnhoorn, and Lucian Pianne’s music from SORORITY ROW, remake of the 1980s slasher movie that had been scored by Richard Band. 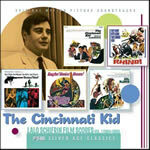 FSM’s latest large scale offering is THE CINCINNATI KID: Lalo Schifrin Film Scores, Vol. 1 (1964-1968), a generous 5-CD helping of some of Schifrin’s finest work of the late 60s – including healthy doses of scores from RHINO! (Ivan Tors’ 1964 take on Howard Hawk’s HATARI! From 1962; and Schifrin’s first Hollywood film score), THE VENETIAN AFFAIR (1967), ONCE A THIEF (1965), SOL MADRID (1968), and of course the title score, plus tracks from a couple of Schifrin’s movie themes LPs. Most of these are represented by their soundtrack album tracks plus the full score tracks. Limited to 2000 copies, includes thorough and very informational album notes by Jon Burlingame. Composer John Debney has been chosen to score another one of this summer’s most anticipated blockbusters. Hot off the sessions for IRON MAN 2, the Academy Award-nominated composer will write the music for the action horror movie PREDAT0RS directed by Nimród Antal. This marks the fifth collaboration with writer and producer Robert Rodriguez for Debney. Earlier projects include SIN CITY, the first two SPY KIDS movies and THE ADVENTURES OF SHARK-BOY AND LAVA-GIRL. Twentieth Century Fox opens PREDATORS everywhere on July 9. French composer Bruno Coulais, who has been noted for his scores for “art film” documentaries like WINGED MIGRATION, MICROCOSMOS, and WHITE PLANET (PLANETE BLANCHE), has completed scores for two of the year’s highly anticipated documentaries. In Disneynature’s OCEANS (opening Earth Day, April 22), Coulais explores the depths of the seas, its inhabitants and the dangers of the ocean. For Focus Features’ BABIES (opening May 7), he creates a delicate, light, funny and emotional score as the film simultaneously follows the life of four of the world’s newest human beings. Coulais’ scores are innovative and idiosyncratic with their combination of orchestral pieces, toys, ethnic instruments and children’s voices. Mixing orchestra and adding contrapuntal themes tease additional meanings and emotions from a scene according to Coulais. “OCEANS is more than a film. It is a manifest for nature,” Coulais said. 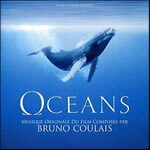 To capture the great depth of OCEANS Coulais tries to convey through music how beautiful and yet how fragile the world of nature is. 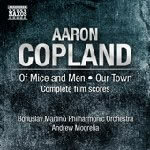 His score is written for a full orchestra, a kind of concerto for harp and violin with electronic sounds. His score was recorded in Paris featuring French soloists Marielle Nordmann (harp) and Laurent Korcia (violin); along with the French choir Mikrokosmos. A soundtrack album is now out on Columbia/Sony Music of France. BABIES is a visually stunning film that simultaneously chronicles the lives of four of the world’s newest human inhabitants – in Mongolia, Namibia, San Francisco and Tokyo, respectively. The joyful documentary follows the babies from first breath to first steps, on a journey at once universal and amazingly original. “The music of BABIES was written for a very special orchestra that included a lot of toys, a string quintet, wind orchestra, ethnic instruments, piano and percussion,” says Coulais. “The words of the lyrics have no meaning. The vocals sound like the beginning of human language.” Although the cast of BABIES is international, “we didn’t want to adapt the music to the nationality of the babies, but to be universal.” Vocals were recorded by French artist Rosemary. 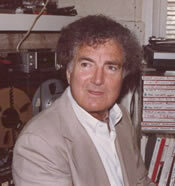 Silva Screen Records has released digital downloads of several of its previously released soundtrack compilations, including THE VALLEY OF GWANGI, an essential collection of difficult to find Jerome Moross compositions, including the title score for the Harryhausen stallions-versus-saurus fantasy, Greek Film Music, compilation of music by Greek composers, including Mikis Theodorakis, Manos Hadjidakis, and Vangelis. The music is performed by The City of Prague Philharmonic conducted by Nic Raine, featuring the The Martin Kershaw Bouzouki Ensemble. The album features a bonus track, Greece’s number one female singer Haris Alexiou sings the song from Phaedra. Also released digitally is James Bernard’s 1995 score for a video cassette reissue of the classic German horror film, NOSFERATU – the former Hammer composer’s last feature film score, and one that provides for this silent Dracula film a score as stunningly dynamic and thunderous as his Hammer DRACULA scores of the ’50s. These albums are part of Silva Screen Record’s year-long campaign to reissue Silva Screen Record’s catalog digitally in the United States and Canada for the first time. The recording will be available via iTunes, Amazon, Napster among many other digital platforms. Silva Screen hopes that the campaign will go some way to meet the growing demand for the excellent and varied music found within the genre of soundtracks. Award-winning Hollywood composer and multi-instrumentalist Danny Pelfrey’s original music for the Dreamworks animated film JOSEPH – KING OF DREAMS (2000) was recently featured at Knoxville Civic Auditorium. Maestro Lucas Richman conducted the Knoxville Symphony in a performance of Pelfrey's score. Pelfrey’s stirring score to the prequel of Dreamworks’ PRINCE OF EGYPT received critical acclaim; the composer rewrote the score as a symphony the live orchestral performance in Knoxville. Regarding composing music for the 21st century, Pelfrey said, "Film and Television are great mediums for a contemporary composer, a great place to participate. The process of composing for picture runs the gamut of human emotions; it can be terrifying, satisfying, provocative or transcendent. Composing music really is my great love." Perseverance Records has announced that David Newman’s seminal score to Willard Carroll’s THE RUNESTONE is now available for preorder. 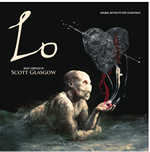 The album features all the cues for the movie in chronological film order and comes with a 20-page booklet (the label’s biggest so far) that chronicles the film and score’s creation, written by Daniel Schweiger. Notes game composer Tom Salta has written and produced an original musical score for Red Steel™ 2, Ubisoft’s new first-person action title developed exclusively for the Nintendo Wii™ and designed with full Wii MotionPlus™ integration. In Red Steel 2, the player becomes a swordsman who finds himself in a remote mixed metropolis in the middle of the American desert, where Eastern and Western cultures collide. To reflect this adventurous new setting, Salta composed an action-packed Wild West, guitar-driven score blended with evocative Asian music influences. For the Red Steel 2 score, Salta enlisted the virtuosic guitar performances of veteran studio musician Steve Ouimette and recorded various instrumentalists for Chinese percussion, shakuhachi, fue, pipa, harmonica and violin. Salta previously scored the original Red Steel soundtrack that received numerous accolades for its vibrant musical palette, including IGN's Wii Award for Best Original Music.